Guinea pigs have large, ever-growing teeth that require attention and care to keep them healthy. As a responsible owner, it's up to you to know what to look for and how to care for your guinea pig's teeth. You must take care of dental issues immediately because improper tooth care can lead to death. Through regular inspection, you ensure that your guinea pig will have a long, healthy life. Without proper dental care, you risk death through starvation. Because a guinea pig's teeth are always growing, they need constant care to ensure that the teeth don't grow long enough to prevent eating. If the teeth grow too long, the animal cannot get food into his mouth, leading to starvation. Take care of your guinea pig's 20 teeth to ensure that your pet stays healthy. Pay close attention to your guinea pig's eating habits. Changes in her eating habits may be the cause of tooth problems. When you perform a weekly health check, always check the teeth to make sure they are wearing evenly, there are no cracks and that the teeth aren't discolored. Lastly, weigh your guinea pig on a regular basis. If your guinea pig's weight starts to drop, there could be an issue with her teeth that is preventing her from eating properly. Provide chew toys, chew sticks and even dog biscuits to help keep your guinea pig's teeth at the proper length. You should also provide a diet high in vitamin C to keep the teeth healthy. Carrots, apples and cabbage are nutritious additions to your guinea's pigs diet that also help the teeth, but introduce them slowly to avoid diarrhea. 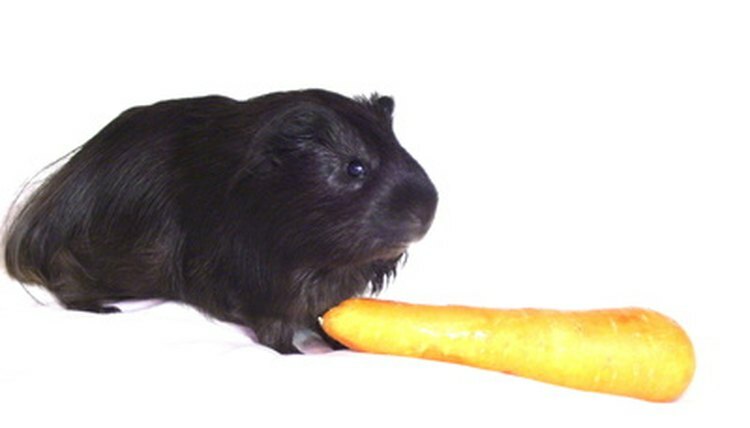 Regular clipping of the teeth is not recommended, as it can interfere with the guinea pig's eating habits. If your pet experiences tooth problems, veterinarian care may be necessary. If your guinea pig's teeth become too long, they may need to be trimmed, which your vet should do to prevent injury. You also need to seek veterinarian attention if you notice a change in your guinea pig's eating habits or damage to the teeth. What Does It Mean When a Guinea Pig Grinds Its Teeth? What Is CUPS Disease in Dogs?